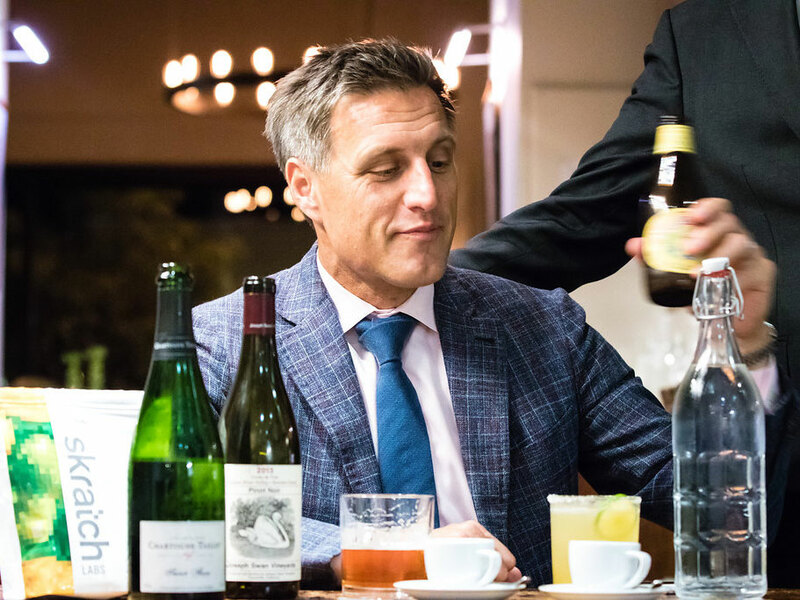 A Food & Wine Sommelier of the Year in 2018, Karr wakes up with a special tea, hydrates with LaCroix, then dives into Grand Cru Champagne, Cru Barolo, and Montenegro on ice. In our series, Liquid Diet, a professional drinker journals every sip of one beverage-packed week. Here, sommelier Carlin Karr, one of the Food & Wine Sommeliers of the Year in 2018 and the wine director at Boulder, CO's Frasca Food and Wine and Pizzeria Locale, and Devner's Tavernetta, documents a week of mixing cocktails with Mahon gin; drinking vintage Arcadian wines with owner Joe Davis; crushing LaCroix on drives to and from Denver, ogling over a 2015 Danilo Thomain L'Enfer d'Arvier with Bobby Stuckey and her somm team at Frasca; enjoys an unexpected 2015 Domaine du Vieux Telegraphe; and brushes off the week with a Montenegro on ice. 9:00 a.m. Wake up and drink a glass of still water. 10:00 a.m. I grab breakfast at a Boulder mainstay called Tangerine with my husband, Adam, and our friend, Aaron Shaw. I drink three cups of black coffee with a splash of cream (I usually don't drink this much coffee but the coffee isn't feeling very strong). 2:00 p.m. Go to the grocery store to prepare for the night... I drink a classic black iced tea with lemon, unsweetened, while there. 5:00 p.m. Party time. Adam and my long-time great friend, mentor and Frasca Sommelier Matt Mather and I begin this Sunday dinner party at our house with gin & tonics. Mather has recently been obsessed with a Spanish gin called Gin Mare, but that isn't distributed in Colorado, so instead I serve him one with a gin from Menorca called Mahon. I use Fever Tree tonic and garnish with a lemon peel, rosemary, and a splash of Cocktail Punk Morning Grapefruit Bitters. Then, we proceed to have what I call a "wine party" for the next six hours: we open Gonon Chasselas, a Rhone white, but it is too full bodied, and it's a hot day, so instead we drink a 2016 ColleStefano Verdicchio. With dinner, we open a 2012 Grange des Pères Rouge and 2012 Jamet's Côte de Rôtie, which both kill it. So good. 8:30 p.m. After dinner, our friend Colin Kirby comes over. He brings a 2015 Hudelot-Noellat Bourgogne Rouge, which was so yummy. We also drink a 2014 Genot-Boulanger Les Vergers, Chassagne-Montrachet Premier Cru and 2015 Luis Rodriguez Os Pasos Ribeiro Blanco Vina de Martin. 7:00 a.m. Wake up and have two glasses of still, cold filtered water. Take my pills, feed my dog Coche—a Golden Retriever-Red Lab mix—and play fetch with her in the yard for a bit. 7:30 a.m. I make matcha with Four Sigmatic Mushroom Matcha Powder and equal parts hemp milk, coconut milk, and almond milk. Warm and whisk. This is as "Boulder" as it gets! Then I tackle emails and study for a couple of hours. 10:30 a.m. Work out and drink one full liter of still water with one tab of NUUN energy (lemon lime flavor). Shower and head into work—today I am at Frasca Food and Wine in Boulder. 2:00 p.m. I drink a one-liter water with a heaping spoonful of Skratch Labs Recovery Mix (last night was a little too much wine). Skratch labs is always helpful for these days. 5:00 p.m. Every Monday at Frasca we have a winemaker dinner. Tonight we have Joe Davis of Arcadian Winery from Santa Barbara. Joe is a legend. Joe does a staff training tonight and we taste through the three wines we are pouring for the wine flight. First off is a 2011 Arcadian Chardonnay from the Clos Pepe Vineyard—the current release. It is rich and vinous yet still taught after spending four years in barrel. Next is a 2009 Arcadian Sierra Madre Pinot Noir—a 100 percent whole cluster wine, which also spent three years in oak. So fresh and complex—a stunning California Pinot Noir. Last is the 2008 Arcadian "Sleepy Hollow Vineyard" Syrah. The Syrah vines are cuttings from Cornas producer Auguste Clape—it's olivey and meaty, truly Northern Rhône in style. An excellent flight of wine. Joe Davis is an incredible winemaker. 8:00 p.m. Throughout service, I drink a liter of still filtered water. 10:00 p.m. Go home and drink water only. 7:00 a.m. Wake up and have two glasses of still filtered water. 7:30 a.m. I start my day with Song Tea's "New Craft Meizhan" 2016 Organic White Tea from Fujian, China. Song Tea proprietor Peter Luong taught me all about fine teas about 10 years ago in San Francisco. All of their teas are incredibly complex, nuanced, and aromatic. Worth every penny. This one tastes like cream of wheat and green fig. It has a soft milky texture—so good. 11:00 a.m. Drive to Tavernetta in Denver. The drive is 38 minutes and I usually drink a LaCroix on the ride—today it is the grapefruit-flavored Pamplemousse. 12:00 p.m. I've got three appointment tastings, all back-to-back. I tasted about 50 wines in two hours—this is usually how I taste. I take notes on every single wine in a Moleskine notebook (I have 10 years of these notes). Today, I taste with three suppliers. The highlights for me were from Craig Lewis, owner of Stelvio Selections, who brings Ciro Picariello 'Ciro 906' Fiano di Avellino DOCG from Campania, Italy. This is a wine I have been trying to get into Colorado for years! Lewis also brought some great Sangiovese, and my Vias rep, Chris Blacklidge, brought some great Alto Adige whites from Pacherhof—I especially like the Riesling. Of the 50 wines tasted, I buy six skus for our restaurants. 4:00 p.m. I begin service at Tavernetta. I taste a few wines on the floor including a 2014 Ornellaia, 2011 Castellare "I Sodi di S. Niccol" and a 2009 Stella di Campalto Brunello di Montalcino Riserva. I also drink a liter or two of filtered still water. We sell a ton of wine this night. Busy little Tuesday. 11:30 p.m. Back in Boulder, I make a "Mexicano" Spritz when home: 1/2 ounce Del Maguey Mezcal Vida,1/2 ounce Campari, soda water, lime, rocks. 7:00 a.m. Wake up and drink water and an espresso. 10:00 a.m. I take another espresso and attack emails. 11:00 a.m. Head to Denver with a Topo Chico lime mineral water in the car. 12:00 p.m. Tasting in Denver with Master Sommelier Anthony Anselmi MS of Rare Wine Co. We taste through 16 great wines. Best for me are: Bernabeleva Gartxas from Spain, a Jacques Selosse "Initial" Grand Cru Blanc de Blancs Champagne, 2015 Domaine Louis Boillot Les Pruliers Nuits-Saint-Georges Premier Cru, 2015 Domaine Rene Rostaing Côtie-Rôtie Cuvée Classique Ampodium from the Rhône, 2015 Descendientes de J. Palacios Mencia "Las Lamas," 2014 Jean-Philippe Fichet Les Referts Puligny-Montrachet 1er Cru, 2013 Giuseppe Mascarello e Figlio "Santo Stefano di Perno" Barolo DOCG, and a 2013 Bartolo Mascarello Barolo. 2:30 p.m. Meeting with two of our owners, Bobby Stuckey and Peter Hoglund, and the chef and GM of Tavernetta, Ian Wortham and Justin Williams. We all indulge in sparkling water. 3:15 p.m. I open a bottle of wine that the somm team at Tavernetta hasn't tasted yet. Today I pick a 2015 Danilo Thomain L'Enfer d'Arvier from Valle d'Aosta—a petite rouge. Our somms Clara Klein, Tyler Potts, Audrey Frick, Brian Shrader and Bobby and I all taste—I have always been a huge fan of these wines, and have officially been buying this one for nine years! The wines from Valle d'Aosta are especially fun during the spring and summer months. 6:00 p.m. I head back to Boulder and drink another Topo Chico in the car and get stuck in horrible traffic, but thankfully make three different calls with suppliers to eat up the time and make it productive. 7:00 p.m. Have a G&T with my husband: Reisetbauer blue gin, Fever Tree, rosemary, lemon peel, grapefruit cocktail Punk bitters. 9:00 p.m. We order soup dumplings and noodles for dinner and drink a NV Vouette et Sorbée Cuvée Fidèle Extra Brut Champagne with dinner—a surprising combination but it works. 7:30 a.m. Wake up and drink two glasses still water and two espressos. 11:30 a.m. Head to Frasca, drinking a liter of sparkling water and meet with Peter Hoglund at noon to write a plan for our summer intern, Emma Wood. Peter Liem sent her to us, she is about to start business school at Stanford. We're so lucky to have her this summer. 12:30 p.m. I taste a new daiquiri that bar manager Brent Oberholzer is making. 3:45 p.m. Pre-service at Frasca. We roll out a new rosé by the glass—the 2017 Domaine St Andre de Figuiere "Signature Magali" Rosé from Côtes de Provence. We taste the staff on it and it's delicious and unctuous, showing the ripe generosity of the vintage. 5:00 p.m. Begin service at Frasca. Tonight is CU Boulder graduation! It is our busiest service of the night. We do around 189 covers—a ton for Frasca. I tasted from four bottles of 2015 Monteraponi Chianti Classico, which lately have had some variation, so I taste to make sure they are sound before serving. Other than that, it's just water all night. A true marathon. 12:00 p.m. Head home and have mezcal straight up—Del Maguey single village Santo Domingo Albarradas. 7:30 a.m. Wake up and have tea from Song Tea—this time it is Lishan Winter Sprout from Taiwan, which has a heartier green, roasty, seaweedy flavor profile. 11:00 a.m. I have a LaCroix and head to Tavernetta. 12:00 p.m I taste through about 40 wines with suppliers. Mostly Italian wines. One of the tastings is with Gianluca Bisol from the Veneto, a legendary Prosecco producer. He is awesome and making great Prosecco. I also taste some fun wines from Vineyard Brands: the highlights are: a 2017 Miraval Rosé, 2015 August Kesseler R Kabinett Riesling, 2016 Domaine Louis Michel & Fils Grenouilles Chablis Grand Cru and a 2015 Beaucastel Chateauneuf-du-Pape. 3:00 p.m. Meetings and sparkling water. 4:00 p.m. Justin Williams, the GM of Tavernetta, ropes me into a last minute event across the street at Deloitte. I speak to a group of 75 people for about 20 minutes about wine—mostly a Q&A. They have a bevy of wines for their group, but the only wine we tasted, the only Old World wine, was a 2015 Domaine du Vieux Telegraphe Chateauneuf-du-Pape. 6:00 p.m. Drive back to Boulder and drink half a bottle of Smartwater. 8:00 p.m. Indulge in takeout with my husband Adam, and a bottle of Roger Pouillon Brut Reserve Champagne. 10:30 p.m. A pour of 1986 Pellehaut Armagnac on the rocks. 8:00 a.m. My day off begins with water, espresso, and a workout. 12:00 p.m. We go to the Boulder Farmers Market, and I drink a LaCroix. 2:00 p.m. Enjoy a flight of fresh pressed juice shots—turmeric, ginger and beet. 4:00 p.m. I start cooking dinner and we pop a bottle of 2015 Ingrid Groiss In der Schablau Reserve Grüner Veltliner from Weinviertel. I love this wine—so good. 7:00 p.m. Dinner time. Roasted chicken, roasted radicchio, carrots, spinach. I initially open a bottle of Raul Perez Mencia, which is a delicious red, but not right for the food, so I open a bottle of 2013 Stella di Campalto Podere San Giuseppe Rosso di Montalcino—this is perfect with the roasty flavors and bitter radicchio. At this point, I assume my palate craves these bitter Italian flavors, but also I just crave great Sangiovese. 10:00 p.m. Montenegro on ice with an orange peel and then to bed. The following day would be brunch service for Mother's Day—pouring Krug Rosé by the glass for the mothers of Boulder.